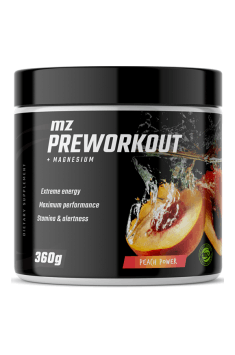 MZ-Store Pre-workout is a pre-workout supplement whose simple composition is its greatest asset. Thanks to the use of optimal portions of exclusively most effective compounds that promote the training efficiency, this product is reliable support in situations of increased effort. On the market, there are plenty of pre-workout supplements containing proprietary blends which conceal the content of individual ingredients. The active substances themselves contained in such products are also often questionable. They have little or no scientific evidence for their activity, whereas their complicated, professionally-sounding name does not entail the actual effectiveness. The pre-workout created by Muscle Zone is the complete opposite of such supplements. Caffeine – purine alkaloid responsible for the stimulating effect of the known-for-centuries infusions based on coffee or yerba mate. Caffeine owes its popularity to multi-directional effects. First of all, it is a competitive inhibitor of adenosine. This means that it is able to bind to the receptors of this nucleoside without stimulating them. As a result, it limits the transmission capacity of adenosine, whose role in the brain is to signal fatigue and limit the activity of neurons. Secondly, it is a competitive inhibitor of cAMP-phosphodiesterase, an enzyme that converts cyclic adenosine monophosphate to a biologically inactive, non-cyclic form. In this way, caffeine promotes the concentration of cAMP in the body, which increases the synthesis and activity of epinephrine with a strong stimulating effect. The high amount of cyclic adenosine monophosphate also accelerates myocardial function. Finally, the effectiveness of caffeine on the promotion of exercise capacity is also possible through its metabolites. Theophylline, through the diastolic action towards bronchial smooth muscle, promotes respiratory efficiency. In turn, theobromine shows a vasodilating effect, promoting the transport of blood with nutrients to the peripheral tissues of the body. Citrulline – is a non-protein amino acid commonly found in watermelons, known for its ability to cause the feeling of the so-called "muscle pump". This phenomenon is the result of the vasodilating activity of this amino acid. Supplementation with citrulline increases the concentration of arginine in the body, which in turn leads to the increased synthesis of nitric oxide. As a consequence, the lumen of the blood vessels is widening. This allows intensification of blood circulation, which is associated with the improved exchange of nutrients and metabolites in the tissues. The increased amount of energy compounds supplied to working skeletal muscles allows them to work more intensively, which in turn facilitates generation of stronger training stimuli. AAKG – arginine alpha-ketoglutarate, i.e. a combination of alpha-ketoglutaric acid with arginine that increases the absorption of this amino acid. The content of AAKG in the supplement complements the activity of citrulline. The combination of these two amino acids comprehensively promotes the formation of a muscle pump, thus increasing exercise capacity. Arginine may also support exercise capacity due to its presence on the creatine synthesis pathway. The appropriate amount of arginine promotes the efficient production of this highly crucial – for energy metabolism – compound. Beta-alanine – an amino acid that demonstrates its effectiveness through the promotion of carnosine levels in the body. Carnosine, unlike beta-alanine, is unable to penetrate cell membranes, making its direct supplementation ineffective. Beta-alanine binds with histidine in the body cells to form a carnosine whose main task is to buffer the acid-base environment. This is particularly important in myocytes during physical exercise, which causes increased production of lactic acid causing pain that limits physical capabilities. Carnosine neutralizes its action, allowing for a longer and more intense workout. The optimization of pH inside the cells also favors their functioning, supporting regenerative processes. 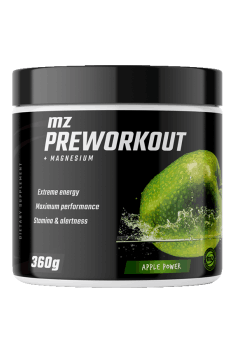 To sum up, MZ-Store Pre-workout is a formula based on ingredients whose effectiveness has been confirmed by numerous experiences of athletes and research. It increases training capabilities and stimulates, allowing for an increase in training efficiency and overcoming the succeeding barriers on the way to the desired goal. Take 1 serving (8,2g) mixed in 250ml of water or another drink 30 minutes before training. Due to the content of beta-alanine in the composition, the supplement may cause a tingling sensation, especially in the chest and abdomen. This is a common side effect of using this amino acid, which is not an indication for its discontinuation. Although the composition of the supplement is based only on 4 components, it is a comprehensive product, covering many levels of supporting training capabilities. It is worth to consider combining it with a portion of creatine. Pre-workout Red Apple: arginine alpha ketoglutarate 2:1, citrulline malate 2:1, beta-alanine, caffeine anhydrous, Aquamin MG, apple flavor, silica, sucralose, Sucrativ, beta-carotene. Pre-workout Peach: arginine alpha ketoglutarate 2:1, citrulline malate 2:1, beta-alanine, caffeine anhydrous, Aquamin MG, peach flavor, silica, sucralose, Sucrativ, beta-carotene.